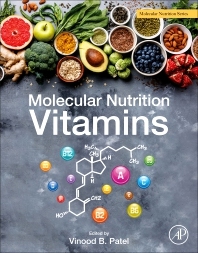 Molecular Nutrition: Vitamins presents the nutritional and molecular aspects of vitamins with a specific focus on vitamins A, B1 (thiamine), B2 (riboflavin), B# (niacin), B5 (pantothenic acid), B6, (pyridoxine), B7 (biotin), B9 (folate), B12 (colbamin), C, D, E, and K. As part of the Molecular Nutrition series, this book discusses introductory aspects and general coverage of vitamins and nutrition, the molecular biology of the cell, including signaling, transporters, oxidative stress, receptors, uptake, immunity, proliferation, endoplasmic reticulum, differentiation, carcinogenesis and apoptosis. Final sections cover genetic machinery and its function, transcriptional processes, homeostasis genes, cancer, gene expression, mutations, and more. Emerging fields of molecular biology and important discoveries related to diet and nutritional health are also covered, rounding out the book. Vinood B. Patel, BSc, PhD, FRSC, is currently a Reader in Clinical Biochemistry at the University of Westminster and honorary fellow at King’s College London (Diabetes and Nutritional Sciences Division and the Department of Nutrition and Dietetics). He presently directs studies on molecular and metabolic pathways involved in organ disease, particularly related to subcellular organelles and cell death. He directs research into the role of nutrients, antioxidants, phytochemicals, minerals, toxins and macronutrients. Other areas of interest are identifying new biomarkers that can be used for the diagnosis and prognosis of disease and understanding oxidative stress. Dr Patel graduated from the University of Portsmouth with a degree in Pharmacology and completed his PhD in protein metabolism from King’s College London in 1997. His postdoctoral work was carried out at Wake Forest University Baptist Medical School studying structural-functional alterations to mitochondrial ribosomes, where he developed novel techniques to characterize their biophysical properties. Dr Patel is a nationally and internationally recognized liver researcher and was involved in several NIH-funded biomedical grants. Dr Patel has edited more than 20 biomedical books in the area of nutrition, health and disease and has published over 150 articles In 2014, he was elected as a Fellow to the prestigious Royal Society of Chemistry for bridging the academic and intellectual gap between chemistry and biological function.